Park Geun-Hye: the woman that changed it all. The first female president in a country where only 16% of the congress are women; a promise in a nation where the median wage gap between men and women clocks at 36.7%, the worst among OECD nations. She was the once rising star that challenged the male-dominated, Confucianist sphere of Korean politics — and now, the woman that will forever be imprinted as “the puppet of a shaman”. Indeed, the facts of the story are ample for even the most benign of journalists to rip into: the daughter of a past dictator, who became so reliant on a person (Choi Soon-Shil) who claimed to be able to communicate with her dead mother that everything—from wardrobe choices, presidential speeches, governmental decisions, to pressuring corporations to donate to sketchy “NGO”s —was controlled by the figure behind the scenes. Corruption has always had an implicit presence in Korean politics, but never before have the citizens seen such a brazen display of irrationality. Corruption for personal gains, one can logically comprehend; but one for an emotionally-dependant shaman that resulted in nothing but economic net loss? Embarrassing. To digest this anomaly, some are seen digressing back to the most primitive of rationales: the virtue of her being a woman. It was her excessive emotional attachment, one that squelched any spot of rational thought, that led to this situation. And as we all know, irrational emotiveness is an inevitable female trait. One can observe the years of progress in the woman’s status in Korean society—which wasn’t so progressive to begin with—dwindle back to the ingrained gendered understanding. People just need a firm root to point a finger to, and what better than a centuries-old system already in place? It would be hard to understand Park’s characterization in the Korean context without factoring in her femininity. An article published in 2013 by Joong-Ang Ilbo analyses and predicts Park’s upcoming presidency: it emphasizes how important it is for female leaders to play up their “soft leadership”, characterizing the features of a woman leadership to be “softness, [moral] cleanliness, and delicacy”. It proceeds to claim that Park’s forte is “her softness that can be physically seen”, one that seeps through her “bright smile”, and her “elegant and classy princess-like, Queen-like fashion that softens the eyes of those looking at her”. Here, Park’s physical appearance is given as an example of her strength. It seems that even at the highest level of political achievement, women cannot be commended solely for their intellectual traits. Some other keywords for the female president were “warmth” and “emotional politicking”. The article further goes on to claim that the ex-president Lee Myung-Bak helped contribute to the cry for this so-called “feminine politics”; he was, definitively, a male politician, one that exuded more calculative coldness than a soft warmth. This perceived notion of motherliness and softness, her femininity, was what gave her edge and acted as one of her greatest assets at the time of her election. And so what one can observe at her fall is the other edge of the sword, the twist of femininity. “Emotional dependency” takes the spotlight. A recent article on Joong-Ang Ilbo, titled “The Weakness of Female Leadership”, emphasizes the emotional dependency that Park held toward Choi, extrapolating it to be a women’s trait. The journalist even traces back in history to give “further evidence”, mentioning the case of Empress Lu Zhi of the Han Dynasty—and more specifically, how she showcased a typical type of female politician, one who “ignores official procedures and law and instead pigheadedly pushes through, in the manner of an annoying ajumma (Korean equivalent of “auntie”)”. Whether in her rise or fall, a woman’s mobility in society seems to be forever entrenched in her female qualities. Even Jae-Myung Lee, the city major of Seongnam, was criticized for calling Choi a “baseless, lowbrow anyuja”, because of what the Korean word anyuja connotes. It’s an old word, used in the plural, that groups women and children together; the equivalent does not exist for males, hence communicating the lack of agency that women hold—they forever remain in the same premature category as children. In the modern context, it is used to refer to “insignificant” married women, an amorphous cluster without any remarkable, distinguishable characteristics. Translation: “if anyone asks for the future of female presidents, tell them to raise their head and look at [South] Korea”. In the civilian sphere, the misogyny rings even clearer. 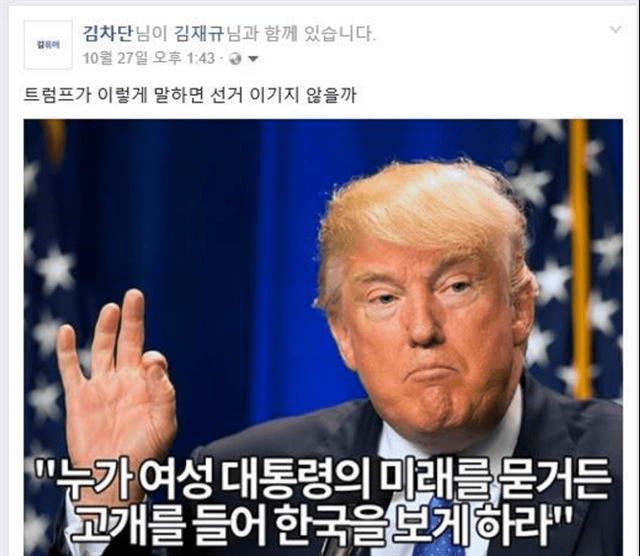 A meme of Donald Trump began circulating, complete with the caption “if anyone asks for the future of female presidents, tell them to raise their head and look at [South] Korea”. The word anyuja is, again, commonly mentioned in comment sections, along with the expected lines of “this is what happens when a woman becomes a president”. A frequently quoted phrase is the Korean aphorism “when a hen cries, the home is ruined”, signifying that when a female meddles in the household matters, and furthermore is stronger than the male in the household, the home will be in ruins. Even in the recent protests, the misogynistic denunciations became so bad that a group was formed to fight against the misogynistic focus. Under the name of “Feminist Movements for Park Geun-Hye’s Impeachment”, the group carried placards at the protest urging fellow protesters to avoid using particular gendered swearwords, and to shift the perspective of blame from “the problem that is devious women” to simply “a president who ruined democracy”. Herein lies the problem: seeing a woman as women, rather than an individual. A plural being, of whom every action is representative of the gender as a whole, and owed to her gender. This way of thinking fundamentally denies women the right to be an individual, as their traits and actions cannot escape their ties to societally constructed “feminine” behaviours. To point out and celebrate the instating of a female president is okay, as it indicates the very real glass ceiling that exists for every person that isn’t a cisgender white male, and further the ceiling’s first signs of tear. But to project upon her success a narrative of “up-playing her femininity”, and moreover to her downfall an inherent weakness of all females in power, is dangerous and damaging. To assess an individual by his or her inevitable being—be it gender, race, religion, or sexual orientation—instead of examining the individual is lazy, a way of grouping the world into bite-sized, predictable categories. Park was a problematic president because she unconstitutionally assigned power to a civilian, not because she was a woman. As Daryl Yang’s article pointed out, only when we adopt a neutral lens can we give people of all gender spectrum the freedom to occupy their own space: to take due responsibility for wrongdoings, and deserved praise for accomplishments, not as a gender, but as an individual. Why hasn’t Yale-NUS Released the Admissions Statistics for the Class of 2020?